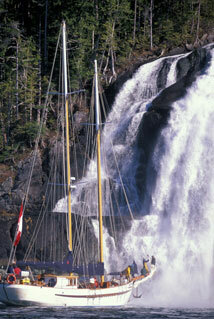 Welcome to Denny Island gateway to the Great Bear Rainforest and the Central Coast of British Columbia! British Columbia's Central Coast has the world's largest intact temperate rainforest and is home to coastal wolves, grizzlies, black bears, eagles and the Kermode "Spirit" bear. Denny Island is a prime wilderness destination offering ocean kayaking, wildlife viewing, bird watching, diving, cruising and some of the best sport fishing around! Wonderfully remote in the heart of the Great Bear Rainforest, Denny Island is a great connecting point for many eco-tour adventures. Denny Island is accessible by plane and water (see Getting Here). Denny Island is located approximately 100 nautical miles north of Port Hardy on Vancouver Island, and 76 nautical miles west of Bella Coola. British Columbia’s Central Coast has the world’s largest intact temperate rainforest and is home to coastal wolves, grizzlies, black bears, eagles and the Kermode 'Spirit Bear'. Denny Island is a prime wilderness destination offering ocean kayaking, wildlife viewing, bird watching, diving, cruising and some of the best sport fishing around! Click here for a map of roads and trails, get current weather conditions here, and take a look at the harbour through the live webcam here. Denny Island is a vibrant coastal community and home to approximately 100 residents. There are many services on the Island, including a grocery store, liquor store, post office, laundromat/public showers, gift store, hair salon, marina, shipyard, marine/hardware store, fuel dock, restaurant, pub, B&Bs and cabin rentals, a hotel, campground and RV park, and several general contracting businesses (see our Services page). 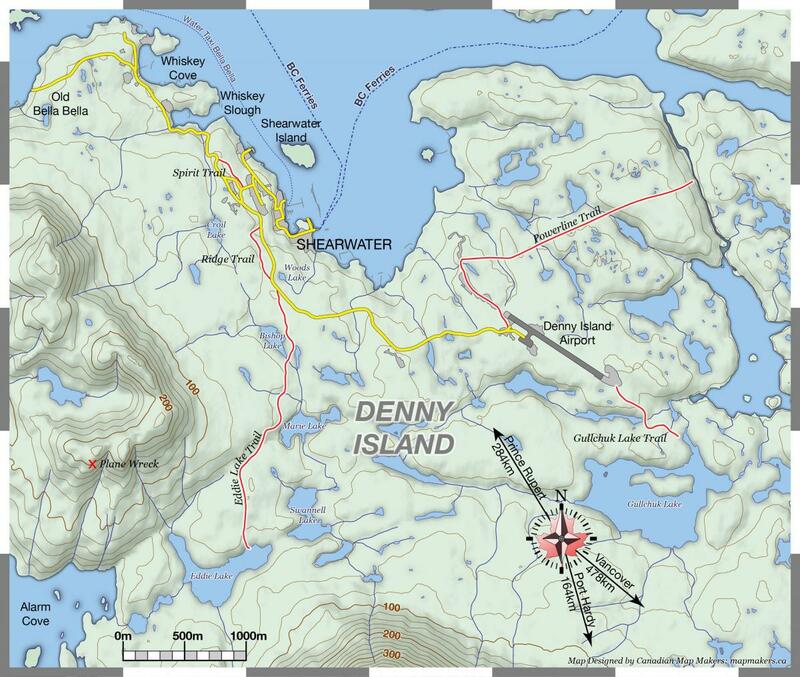 The Royal Canadian Air Force chose the Shearwater site on Denny Island as a reconnaissance base during World War II. The base was built to accommodate over 2,000 military personnel, although there was never more than 1,000 stationed there at any one time. Denny Island has a paved landing strip and a protected float base, and is only a short distance (2 nautical miles) from Bella Bella (Waglisla), located on Campbell Island. A regular sea-bus service connects the communities of Denny Island and Bella Bella.